This year turn the clock back! Discover the magic of sleeping under a real thatch roof. Warm your toes at a blazing turf fire. Taste the salt spray on the sea breeze. Feel the warm welcome of West Donegal, where time meets eternity and old ways linger on. Donegal Thatch Cottages - built in 1982 - a very special kind of holiday, for all the family. Spectacular island setting, joined by bridge to the mainland. Fronting directly onto a beautiful sandy beach. Turf smoke, peaceful walks, deserted beaches, majestic rockscapes, red sunsets, warm sea-breezes, profusion of wild flowers, rare bird-life, winding roads, friendly people. Cruit Island is an E.U. designated "Special Area of Conservation". Thoroughly refreshing golf just down the road at widely acclaimed Cruit Island golf links. Beginners welcome. Anglers paradise, with excellent shore, deep-sea and game angling. 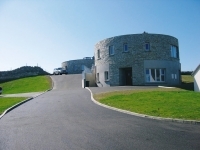 Daily connecting flights from Dublin to Donegal International airport, only 10 kms from cottages. Local Car Hire. Full oil-fired central heating / electric heating, washer-dryers, dishwasher, ensuite shower. Turf on site for open hearth fire. Please note there are no televisions in the holiday cottages. Please note there is an additional cleaning charge of €50 which is payable on departure to the supervisor. Maximum of seven persons per cottage. Extras: 25 euro per person per week if there are more than 5 staying, or 15 euro per person per weekend. Central heating oil, electricity, turf. Towels optional at €5 per person. We regret no pets. 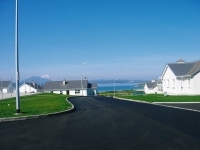 Nearest villages are Dungloe, Burton Port & Annagry - all about 6 miles from the cottages. Please note that there is a 25% deposit taken on new bookings & the balance is due six weeks before arrival. Bed linen is included. Utilities are payable according to usage on departure.